Show openers Tax The Heat took to the stage like a band that has been around the block a few times despite their obviously young age. With their 60s-influenced stomp and retro blues swagger, the pop-rockers delivered a blinding set of upbeat numbers to an increasingly cheerful audience. Sonically, the band produced a blend of Muse-style grandiosity to complement a vocalist reminiscent of Alterbridge’s Myles Kennedy in his more melodic moods. Whilst the band could be considered a leftfield choice to open for classic rockers Black Star Riders, the audience baying for the headline act lapped up their twin-guitar style. A Telecaster’s infamous twang balanced out the gruff low-end of the Les Paul whilst accompanied by the steady rattle of a Precision Bass. By the end of their set, Tax the Heat had demonstrated exactly why they were invited to perform by briefly touching on different elements of classic rock; their rhythm and blues roots were evident and could easily be compared to a young ‘The Who’, in their popular mod-rock era. Headline act Black Star Riders made their entrance with the kind of swagger you would expect from musicians with such a long and varied history; Scott Gorham (guitar) had the audience eating out of his hand and front man Ricky Warwick took command of the crowd with his powerful stage presence. The band’s set list featured a welcome mix of the band’s own songs and Thin Lizzy anthems. What is particularly special about Black Star Riders is that they do not merely sound like a Thin Lizzy tribute act, but an unequivocally relevant force in modern rock music. Ricky Warwick, the former front man of ‘The Almighty’, demonstrates his worth time after time. He could hardly be blamed for basking triumphantly, arms aloft, in the spotlight after delivering anthems like ‘Bad Reputation’ and ‘Jailbreak’. Thin Lizzy stalwart Scott Gorham, whilst visibly aged, shows why he is considered one of rock’s greatest axe men; he can give guitarists half his age a run for their money any day of the week. The stage show evokes the spirit of rock n’ roll excess and decadence of the hedonistic 1970's but the band take time to balance this with a more serious mood; the pace is hastened to reflect on the continuing war and political struggles taking place in other parts of the world before delivering a rousing rendition of ‘Emerald’. This was the sort of performance that makes the hairs on the back of your neck stand on end, where every word the Northern Irishman sings sounds sincere. 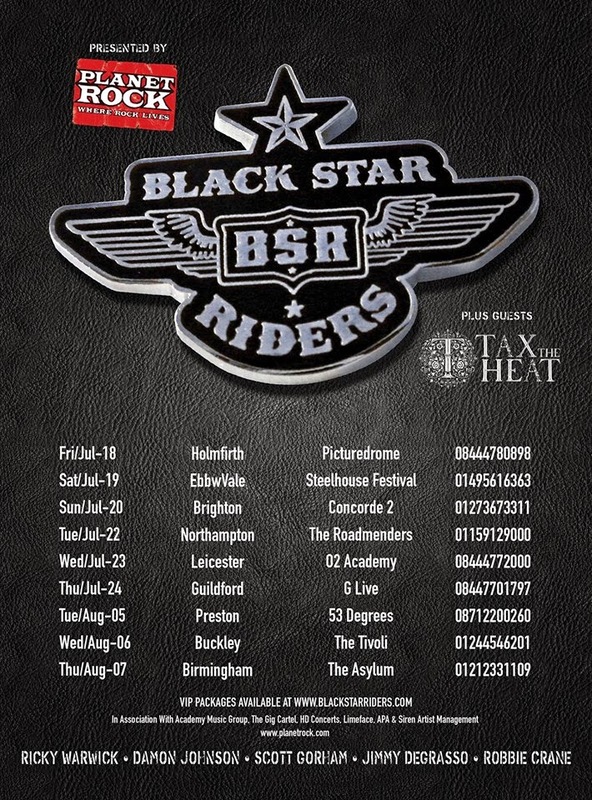 Black Star Riders have developed their own signature tunes, the legendary sing-along anthems that will be remembered for generations – the contemplative ‘Hey Judas’ and the stirring ‘Bound for Glory’ to name but two. Essentially Black Star Riders do not just continue the Thin Lizzy legacy, but build upon it and forge their own place in rock history.